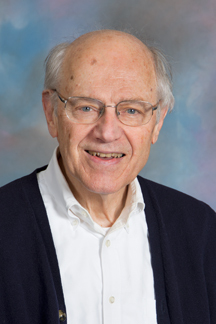 Professor Eberly received his BS in Physics from Penn State (1957) and his PhD in Physics from Stanford University (1962). He joined the UR Physics and Astronomy faculty in 1967, where he is a member of the Quantum Optics research group. Since 1979 he has held an adjunct faculty position in the Institute of Optics. He is presently the Andrew Carnegie Professor of Physics and Director of the Rochester Theory Center. Professor Eberly is a Fellow of the American Physical Society and the Optical Society of America, has been Chair of the APS Division of Laser Science, and was the founding Editor of the journal Optics Express. He was President of the Optical Society of America (2007), and Chair of the OSA Presidential Advisory Committee (2009). He has served as a member of the APS Council 2003-2005, the AIP Governing Board 2003-2005, and as a member of the Advisory Boards of KITP (Santa Barbara), ITAMP (Harvard-Smithsonian) and the Physics Division of Lawrence Livermore National Laboratory. Professor Eberly has been selected for a JILA Visiting Fellowship (1979), a Senior Alexander von Humboldt Award (1984), and the Distinguished Alumnus Award of the Penn State College of Science. He has received the Smoluchowski Medal of the Physical Society of Poland (1987), the Charles Hard Townes Award of the Optical Society of America (1994), the Georgen Award for Creative Innovation in Undergraduate Teaching of the University of Rochester (2000), and the Frederick Ives Medal of OSA (2010). He is a Foreign Member of the Academy of Science of Poland. Professor Eberly's research interests are in the general field of theoretical Quantum Optics, Quantum Information and AMO Science. Recent results from his group include the co-discovery of a new quantum entanglement effect called sudden death, the derivation of area theorems that govern nonlocal effects in coupled optical pulses, and the prediction of new phenomena in high-field double ionization of atoms. Professor Eberly is the co-author of the monograph Optical Resonance and Two-Level Atoms, with L. Allen, and co-author of two texts with P.W. Milonni, Lasers and Laser Physics, and the article on Quantum Optics in the Encyclopedia of Science and Technology, as well as the chapter on Coherent Transients in the APS Handbook of AMO Physics with C. R. Stroud, Jr. He has written more than 350 research papers and reviews. Elliptical Polarization and Probability of Double Ionization, Xu Wang and J.H. Eberly, Phys. Rev. Lett. 105, 083001 (2010). Evolution of Long-Time Non-Interacting Entanglement, M. Yönac and J.H. Eberly, Phys. Rev. A 82, 022321 (2010). Multicolour Entanglement / news & views, J.H. Eberly and J.C. Howell, Nature Photonics 4, 12 (2010). Multipulse quantum control: exact solutions, E. Groves, B.D. Clader and J.H. Eberly, Optics Letters 34, 2539 (2009). Entanglement Sudden Death, Ting Yu and J.H. Eberly, Science 323, 598 (2009).